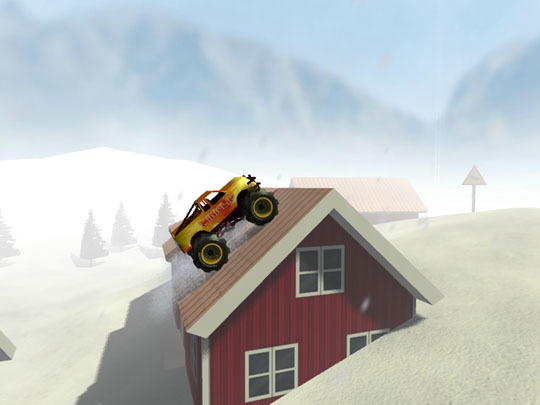 Monster Trucks 360 is 18 levels of fast-paced arcade action, all rendered in silky smooth 3D. 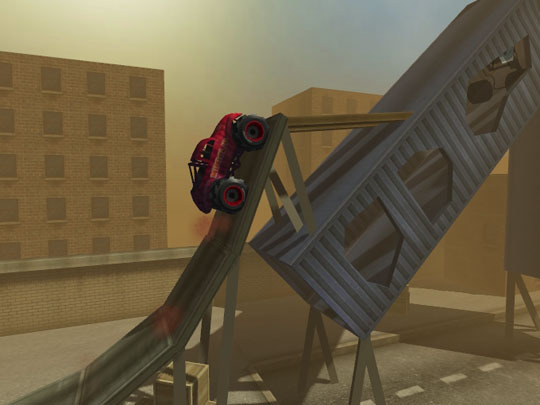 Developed for Miniclip by devm-games, the game is a great example of addictive gameplay combined with beautifully smooth and detailed Stage3D graphics using Away3D. 3D models are exported from my 3D modeling application as .obj-files, which are then compressed when they are embedded in the .swf. I could probably have gained some on using a more efficient 3D format, but .obj was the easiest to use. Levels are .zip-files with .obj-files for the geometry and an .xml-file for the interactive game objects. There’s a separate .obj with the 2D collision geometry (It just ignores the z-axis). The zipped level ends up weighing in at about 200KB-400KB. Because the play area is all in a single plane, Box2D could be used for physics to provide a nice trade-off between complexity and speed. According to Jan, the entire game comes in at under 3.5 meg (excluding the music which was streamed). Check out some more in-game screenshots and the live game link below.